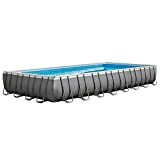 The Intex Metal Frame is our pick for the best above ground pool, which measures 12 feet x 30 inches in its total size. It can be conveniently connected to a garden hose for the drainage system, so it is very easy to set up. It has protection for electric shock due to the ground fault circuit interrupter, so everyone in the area will stay safe. It is best placed in medium sized backyards and gardens. Our step-up pick is the INTEX Prism Frame and it uses a unique hydro aeration technology to make sure that the filter and the pump system are always working properly without degrading the water clarity and quality. It has a flow rate for the pump of up to 2,500 gallons per hour and has a very durable frame construction, fit for large areas. The budget pick is the Step2 Play Shade and this one is the best for kids due to the simple and straightforward design and size. It comes with an umbrella post, as well as two molded-in seats to make it comfortable for your children to play around. There are also some molded-in designs to keep your children stable when they are splashing in the water. 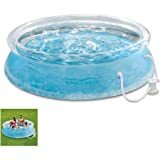 An above ground pool is an inflatable pool that is fit for the summer season. This kind of pool is different from the permanent one with tiles because it is portable and can be placed anywhere. It comes in various designs, shapes and sizes, depending on the area of your garden or yard. It is a very enjoyable form of summer getaway if you don’t like the idea of public pools for your family and just want to have a mini summer party at home. This inflatable swimming area is a great choice if you have kids. Children really love swimming and splashing, and this kind of inflatable device can be a great pastime for them in the summer season. It can serve as a fun playground or play area for them, so that they can be able to enjoy playing games with each other. It helps to develop social skills, teamwork, positivity and sportsmanship among your children. This upcoming summer season, it is a great must-have for your family yard because it can help entertain your children and give them a great summer activity. There can be many sizes of this swimming area. The size should be relative to your yard or garden space. For example, smaller areas should have a small inflatable pool. The size can also matter if you have many kids or may guests in mind, or of you belong to a household with a large family or extended family. Size usually refers to the diameter of the pool itself, as well as the height of the barriers. A proper height barrier is important so that the water will not escape and the children will be kept safe at all times as well. The only downside is the inflation and deflation process, as well as the threat of punctures. The punctures can happen if the inflatable swimming area has been placed in a rough area, or has come into contact with any kind of sharp object, such as knives, rocks and the like. You must try to keep it out of the danger zone to avoid punctures, and also, advise children to avoid horseplay to keep the puncture problems to a minimum. Inflation and deflation for the inflatable swimming area itself, on the other hand, can be tricky for some people, because some of these are too large and therefore troublesome to inflate or deflate. Most of them will come with an automatic pump machine, but for those that will not, it could be hard to do so. On the other hand, the good side about such a pool is that it is less costly as compared to building a large, permanent one. The fact that you can move it around means that it is portable and can be placed in your yard in the summer and taken out by fall or winter. This above-ground pool will usually have an ultra frame, a sand filter, and is a frame pool that may be an automatic pool. Cleaning up the tiles of a regular swimming pool is troublesome, especially if it is full of mold and snow. The convenience of an inflatable swimming area is truly remarkable because it can help you to keep it protected against the elements when not currently in use. Most swimming pools like these will have above-ground pool liners and even automatic pool cleaners. Larger sized inflatable swimming pools are not just for kids, but also for adults and the whole family. For instance, instead of renting a pool somewhere, you can hang out with friends in a very large inflatable pool instead, at the comfort of your own home, without having to leave somewhere and sacrifice privacy and comfort (and also expenses). If you just want to have a simple BBQ party at home, one of the best ways to do it is with an inflatable swimming area or above ground swimming pools. If it is steel or a metal frame pool then it can be durable, with an easy set material, and can be made of galvanized steel. Some can have a pool heater, an automatic pool cleaner, and can be a hot tub as well. Size of the swimming area: it should match the number of people that you are basically expecting in the pool. It should also be in coordination with the size of your land area or backyard area. For instance, you have to measure the diameter of the inflatable swimming area to get a good estimate. Also, you need to know about the height of the area barriers to avoid the likelihood of water leakage and to protect your children when playing in the swimming area. Shape of the swimming pool: most of these inflatable swimming areas area round or circular in shape, but there can also be ones that are rectangular or square, depending on your preferences and what’s available in the market. Much like with trampolines, experts suggest round ones for safety reasons, since they will not have sharp edges or corners that can potentially or possibly harm your child or anyone in the swimming area. Durability: you have to consider if the inflatable swimming area can stand up to the competition by testing out its durability overall. Durability refers to the fact that it can stand on its own properly when inflated, and will also not be easily deflated or punctured due to the materials used. Take note that a higher quality material should be used for making the inflatable swimming area to make it as puncture resistant as much as possible, especially if you have a rocky or uneven backyard and a set of very active kids. Puncture kit included: most and all inflatable swimming areas and inflatable objects come with a puncture kit – even inflatable kayaks. The puncture kit will serve as an emergency patch should something go wrong with your inflatable swimming pool. In the event of a puncture or sudden damage due to uncertain circumstances, you can have yourself an emergency first aid kit to keep your inflatable object up and standing well. Ease of inflation and deflation: the problem with most substandard inflatable swimming areas is that they do not have enough instructions for inflation and deflation, and so the end user must go through a lot of struggle and trial and error moments in order to get it to work. For this, you will need an inflatable swimming area that is truly remarkable in terms of usage and setup, to avoid the hassle of having to fiddle with the inflation and deflation mechanisms that you might not know how to use after all. Safety of the materials used: you have to consider a inflatable swimming area that has toxic free materials in everything. The problem with substandard ones is that they may leech out harmful chemicals which, when inhaled by humans, could be cancerous in the long run. That is why you should avoid such items, and look for ones without toxic chemicals that are prohibited by international and local laws, especially if kids will use them. No rough or sharp edges: this is highly important if you have a set of hyperactive kids who tend to horseplay a lot. Sharp edges and corners might be looking for trouble at hand, so if you want to buy something for kids, make sure it has smooth parts. 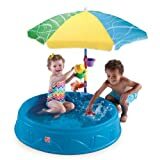 In fact, round shaped inflatable swimming area are much more preferred for kids because of the safety that they offer without the threat of edges or corners. Pump or filter included: sometimes, there are brands like Intex that have a frame pool that may have a start-up kit with a filter and pump, or even heat pumps. 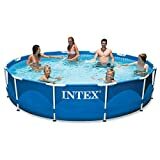 As our top pick, the Intex Metal Frame is a fairly medium large sized outdoor or backyard swimming area that is inflatable, with a Krystal clear cartridge filter pump that can pump up to 530 gallons per hour, which makes it fit for its size. It has a total size of 30 inches by 12 feet and comes with durable laminated PVC sidewalls to make sure that it can stand up to any approach by either children or family members. Water clarity can also be enhanced by this system due to the dual suction outlet fittings that are included n the whole mechanism of the swimming area. In addition to that, drainage can be very easy due to the fact that you may be able to connect a garden hose onto it. The total capacity for water, with this product, is about 1,718 gallons at 90 percent. The cool thing about this product is that it has protection against electric shock and current, due to the included ground fault circuit interrupter in the system. You won’t need harsh chemicals to make it run properly, unlike other systems – just add pool salt and you will be fine. It can fit somewhere between 6 to 7 people in total. While not entirely a big deal breaker, the Intex Metal Frame may have a filter that is not as good as others but you can manually upgrade this as you wish, with a separate garden hose and water test kit vacuum system. The INTEX Prism Frame is our step-up pick, which can have a flow pump rate of up to 2,500 gallons per hour, which means that it is a very powerful system in terms of having your very own backyard swimming area. It has a total of 12,481 gallons for the water capacity, so it can definitely be enjoyed by many people all at once. What’s more, the total size of 52 inches in height and 24 feet in diameter makes it a very accommodating and large area to swim on, or simply splash and enjoy on. The durability of the frame construction is not compromised due to the fact that it is made with strong powder-coated steel tubing to ensure that anyone who gets in the swimming area will feel safe and secure at all times, especially kids who need support and attention. Included in the package is the needed 110-120V cartridge filter pump to get you started. It can also significantly increase the negative ions in your water and keep it as clear as possible while being used thanks to the included hydro aeration technology. Last but not the least, additional supplies like a ladder, debris cover and a ground cloth are also included in the package. As our budget pick, the Step2 Play Shade is a children’s mini swimming area or vacation spot in your very own backyard or lawn. It can be great for toddler feet and smaller children due to the traction it can provide because of the design. Your toddler or young child can sit peacefully and splash away without the worry of slippage due to how it was designed. You can also attach or add a mini umbrella for your toddlers to keep in shade, even in the hottest sun. The umbrella that you can put here can be up to 40 inches in size, so that your children will enjoy playing out in the sun without the harmful UV rays. It requires very minimal assembly as compared to other types of backyard toys for the summer. There are also a total of 2 molded-in seats for added convenience to your little toddler as they can play in the water. Incorporated with the umbrella post is a set of 3 funnel cups, as well as a water wheel that can spin, so that your children will be kept busy while playing, and it can also serve as an interactive way to keep your little ones busy during summer vacation, yet stay in the safe zone. If you want a swimming area with an included A-frame ladder, you can check out the Cornelius Pools Phoenix. It has a pump that has a pumping capacity of 2,400 gallons per hour (40 gpm) , so it is pretty powerful. In terms of size, it is also fairly big due to the 24′ x 52″ frame to keep all of your family and friends safe and sound inside. It also has an ABS thru-wall skimmer to keep it durable. It can be a great setup for the do-it-yourself person who just want a backyard affair in the summer, for your backyard party to become more lively. In addition to that, it is customizable such that you can upgrade the liner because of the easy to assemble kit that allows you to modify it in any way. It can be a great summer activity with your family and especially with children due to the good size of 52 inches deep. The system also has good return fitting and a vacuum plate to make sure that it runs perfectly with the included pump. With a precise fit and stylish design that will look good on most backyards, the filter holds 60 to 70 pounds of sand so it is less of a hassle in terms of maintenance. You can enhance your backyard this summer with this product, which also includes a 4 position multiport valve. Not to worry in terms of setup – it comes with everything that you need. Made with a steel construction for durability and a system base, it is also made with galvanized walls to keep it lasting longer in more summers to come. The Intex Rectangular Ultra is a great Intex pool if you are looking for something that makes the use of a saltwater system to keep it fresh and clean as much as possible. It is also quite sturdy due to the fact that it is supported by durable steel frames in its construction. Moreover, the Krystal clear filter pump does the job in the right way to filter your swimming area in the best way possible. It also has a fairly big size of 32 x 16 feet, with a height of 52 inches overall, which means that it is fitting for most backyards. It has a ground cloth and a debris cover included and is quite easy enough for 2 to 3 adults to set up. Made for big families, it has a set of dual suction outlet fittings for clearer water, so that you will not have to maintain it too much. It has also been powder coated for rust resistance for the frame, to make sure it can withstand the test of time. It also comes with a maintenance kit for repairs. 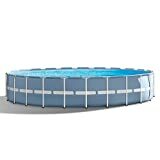 This Intex easy set metal frame pool is made with a steel frame. You can also easily fill up the swimming area with garden hose and it only takes about 2 days to do so with regards to its size. It also includes a ladder for easily getting on and off the swimming area. It has a water capacity of 14,364 gallons for its system and size. For the kids, the Summer Waves Small is a great choice because of the design, which presents the exciting fun that might be experienced when you’re in the sea, due to the bottom drawings. This 8-foot inflatable item is great for children who still don’t know how to swim but want to enjoy being in the water at the comfort of their own home. You can see the vibrant ocean life pattern that sits on the floor, which makes it interesting for kids. With a no leak design, it can also be stored in the basement for the winter and still work just fine, because of its durability. Moreover, the underwater 3D images can seem more realistic due to the included pairs of 3D goggles. All you need is a filter pump bought separately, but it does not require a pump if you can clean it up regularly or as needed. The whole thing has a depth of 30 inches so it is fairly okay for children and small to medium sized yards. The Bestway Rectangular Splash is a cool choice if you want something that is rectangular shaped, instead of round or oval shaped. It is quite easy set up and take down due to the simple design and included user instructions, plus it can fit up to 10 children or about two adults depending on the person’s height and weight. In addition to that, the water capacity of 476 gallons just makes things exciting in the backyard, which also allows the people who splash in it, such as your children, to have more fun without lacking in water capacity. It is also quite durable with polyester 3-ply sidewalls, and it also has an easy to use flow control drain valve for easy draining whenever needed. As an easy to assemble outdoor or backyard swimming area, you also won’t have to worry with the frame due to being made with heavy-duty PVC material. It measures 94 x 59 x 23 inches overall, and all you need is a filter pump for it to function properly. For babies, the Intex Smiley Giraffe is a good choice because it is a cute giraffe in terms of design and is also inflatable so you can easily set it up whenever your children need it. The safety of the product is also what makes it ideal for both babies and toddlers. 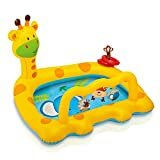 It has a fun design and a size of 44 x 36 inches, with a height of 28.5 inches for the giraffe’s neck. The total water capacity of this outdoor swimming area is up to 14 gallons so it is not too much and on the safe levels for your baby or toddler. It can help them to enjoy summer without compromising on safety. It also comes with a toss ring game, in which inflatable rings are included, so that your little toddler or baby can be greatly entertained in the summer at the comfort of your home. Bearing an oval shaped design, the Bestway Power Steel is a great choice if you want something that is nearly a complete system for outdoor use. It is made with powder coated steel on the frame so that it can be resistant to corrosion as much as possible. The total size of the whole area is 33 inches for the height, and 6 x 9 feet for the oval itself. Being an easy to set up summer getaway, it has also been enhanced by the two layers of laminated PVC to make up the frame, with a total of 3 plies for the materials used. It can hold up to 3,668 liters or 969 gallons of water overall, and comes with a filter pump that goes up to 330 gallons per hour in terms of flow rate. If you want a round shape and a transparent looking swimming area at home in your yard, the SUMMER WAVES Transparent is a great choice for you. It can be used by the whole family and comes with the pump and filter cartridge for ease of set up. There is also no need to worry about the water quality due to the included built-in chlorinator with the package. The top ring design is sure to catch the eyes of your neighbors when you set it up in your yard during the summer season. It has a total diameter of 10 feet across so that the whole family can enjoy splashing in a hot summer’s day to keep themselves cool. It is generally easy to set up and maintain, simple to move around, and does not take a lot of time to maintain or to put together and take apart later on. It has a water depth of 24 inches when full. There were other inflatable swimming areas that did not make it to our list because they were not as durable as the ones we picked. Durability is greatly important in any above ground pool because it gives safety to the users overall. Q: What is an above ground pool? A: This kind of inflatable swimming area, the above ground pool, is a great place for children and families to gather in the summer. It is like a real swimming pool but can be moved from one place to another. It is also much better than the permanent type because you can set it up and take it down whenever necessary, much like a regular camping tent. Q: What are the benefits of swimming for kids? Better physical health The important thing that you need to know about swimming is that it can help you to stay physically fit due to the amount of muscles worked and calories burned within hours of swimming. Coordination and strength Whether you are in an above-ground pool or in an in-ground pool, swimming is a great activity that can potentially enhance your strength and coordination as a whole. Learn safety in the water If you have knowledge in terms of water safety then you can definitely survive, whether you are out in the sea or in the pool. Physical fitness You can also stay physically fit as much as possible if you keep swimming. This can be enhanced if you are already swimming while you are young. Better self-esteem You can also definitely feel more confident with yourself if you have a new skill in life, such as swimming, which can help you to survive or even be competitive in sports. Q: What are the benefits of swimming for adults? It can help tone your muscles. You can use it for strength building. It gets your heart rate up at a healthy pace. You can maintain a better and healthy weight. It can be an anti-stress activity. You can definitely feel relaxed after swimming. It is a full body workout that uses almost all of your muscles. You can endure physical exercises better if you are regularly swimming. It allows you to be more flexible. Swimming helps to cool you down on a very hot day. Q: What are some great home activities for the summer? Backyard camping If you do plan on backyard camping, you can even get yourself an above-ground swimming pool to spice up things and make it exciting, especially for children and large families. Slumber parties Sleepovers are always the best thing to do in the summer after a good day’s activity of BBQ or even a swim at your local inflatable or inground area. Pick garden fruits or flowers You can do this in spring, especially when the fruits in your garden and flowers are all bountiful. Play with the hose or sprinkler and pretend it’s raining There’s nothing more refreshing than making it rain during the summer in your own backyard. Grill or BBQ parties Grilling fish, barbecue and many other kinds of grilled food and recipes can be a fun activity. Pizza making Making pizza is also a fun activity for the whole family and even with friends. Go stargazing at night There’s nothing like seeing the stars in a clear sky at night to help you reminisce life’s wonders. Try board games Board games can help enhance strategic thinking among children and your friends. Grow your own garden Growing your own summer garden also has benefits, not just for your budget but also for your health. Let children help with a home project This teaches your children how to be responsible at home and how to finish tasks with teamwork. Set up a neighborhood lemonade stand It can also help your children learn how to handle money and earn at an early age. Watch movies together You can enjoy family movies or even other shows with your friends during the summer. Prepare dishes and desserts with your kids You can cook with your children to help them experience work in the kitchen. Bubble blowing It is a fun activity for children and toddlers of nearly all ages. Play with pets If you have a dog or cat, you can let your children play with them with supervision. Arts and crafts You can help children get in touch with their artsy side with crafty projects. Treasure hunting You can set up a treasure hunt with your children, family or friends. Brain games or puzzle activities This can help your children to keep their brains sharp even during summer vacation. Q: How can you keep inflatables from getting punctured? Keep pets away from the inflatable object. Make sure you set your inflatable item onto a flat surface, without sharp stones. Avoid over inflating your object to keep it away from blow-outs that can cause punctures. Keep all sharp objects away from the inflatable object. Teach your children to lessen the horseplay while using the inflatable object. Q: What are some safety tips with an inflatable pool? Don’t add toys that are too big or too small This is because it can block your children’s mobility while in the swimming area. Make sure your swimming area is proportional to the number of people in there Too big the swimming area and it can be hard to manage, while too small the swimming area and it could present suffocation and inconvenience. Always assume authority and watch over children when swimming or playing Make sure you iterate rules and regulations when kids play in the swimming area. Don’t invest in a swimming area that is too large for your children and difficult to watch over This is to make sure you watch over everybody as much as you can. Q: How can you repair a punctured inflatable item? Look for a patch kit, if included with the item or object. If not, you can get a patch kit at a local hardware store and use that. Read the instructions and apply the patch kit firmly onto the punctured spot. Don’t forget to test the inflatable item to make sure that it is no longer leaking. Q: What are the disadvantages of a permanent swimming pool at home? 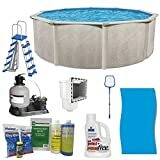 A lot of mold Maintenance is always a hassle with a permanent swimming area due to the fact that you may need a robotic pool cleaner and a sand filter. Expensive to build The swimming area is usually a costly project for most households around the world. Too much maintenance Cleaning the mold is just one step – repairing broken tiles can be a problem, too. Usually more dangerous for kids Tiled floors can be dangerous if your children often dive or backflip. Doesn’t always add to home resale value It is true that some swimming areas, despite the fact that you have invested a lot on building them, may not be appraised properly depending on the price value of your home and the area you live in. Q: What are the benefits of an above ground pool? It’s not permanent. The frame pool can be taken down as needed depending on your needs. Stagnant water is less likely to happen. It usually has a filter pump that helps circulate water, as part of the frame pool set. Most even have a sand filter and a pump system that may even be connected to a heater to kill bacteria. Most people find it easier to install. An in-ground swimming pool is usually simpler in terms of installation as compared to building a regular sized pool, or an inground one. Most have an easy set mechanism, such as the metal frame pools like the Intex metal frame. You can choose what size you need for your home. You can even choose the shape, such as oval pools, and you can choose the material, such as galvanized steel. These swimming areas offer great at-home privacy. The ultra frame, or sometimes the metal frame, can bring privacy and durability at the same time. Try brands like the bestway steel pro or the intex easy set to bring safety and privacy at the same time. Q: What are some common pool toys for kids? Q: What are the important things you need to consider when watching over kids in a pool? Always stay alert when watching your kids in the swimming area. Teach children basic swimming lessons and floating. Consider swimming area alarms to tell if someone is drowning in the pool. Set up a good safety fence of about 4 feet in height. Secure the swimming area with a lockable door (or window if indoors) for safety purposes. Q: How can you inflate an above ground pool? Lay down the whole inflatable swimming area in the place desired. Set the top ring outside the liner sides and inflate it. Test by squeezing to avoid over-inflation of the top ring. Read the instruction manual for other specific actions needed. Maintain the swimming area and its parts as specified in the manual. Q: How can you deflate an above ground pool? Look for a deflating mechanism, such as a clamp, in your package. Refer to the user’s manual on where to apply it on your inflatable swimming area. Deflate the whole thing until all of the air has been let loose. Store the whole swimming area properly. Q: Why do kids love to swim? There’s always a fun factor in splashing around. Swimming with friends also adds to the fun. Children can play games in the water. Q: How can you assess kids who are afraid of water? Spend time in the swimming area with your children to convince him/her that it’s okay. 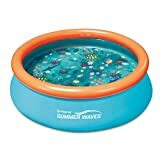 Add some water toys to catch his or her attention. Invite some playmates over, but don’t let them tease the child. Give them goggles to avoid the effects of water splashes. Q: Should you give your children swimming lessons? It is beneficial for their physical health. You can help them become more self-confident. It also teaches them the value of teamwork and friendship. You can teach your child a survival skill needed later in life. Q: What are the drawbacks of an above ground pool? Some frames are not that durable This is because these frames could be made of less stable material and not something like metal. Barriers can be too high and require a ladder An a-frame ladder may still be needed due to the high barrier, like the Intex ultra frame, depending on the height. Can be prone to punctures Punctures will happen with anything that is inflatable, so you should be careful. Q: Can adults also use this kind of swimming area? A: Yes, contrary to popular belief, there are larger swimming areas like this that can be used by adults, which also makes it more like the permanent version of the swimming area. It means that you can enjoy it at any age, as long as the size and the diameter is just right. Q: How do you properly clean this swimming inflatable? Use a hose and pump system, or tank plug, to drain the water. Scoop up any leftover water using a rag, towel or sponge. Make a 5:1 ratio water and bleach (or vinegar) solution. Apply the solution onto the bottom floor with a scrubbing brush. Use a hose to rinse the whole thing. Either refill the swimming area or deflate/store it as needed. Q: What are the benefits of “staycation”? As a whole, we believe that the Intex Metal Frame is our pick for the best above ground pool, due to the ease of setup, ground fault circuit interrupter for electrical safety, and fairly good size for most backyards out there. Because it can be connected to a garden hose, it is also easy to drain when necessary.